Science writer Veronique Greenwood has written a really cool article about her mom, a techno-happy early adopter. 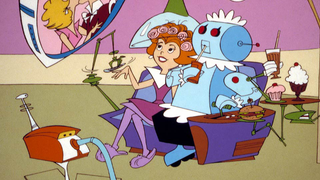 While there was never a dull moment having a futurist for a mom, it was also a bit disconcerting, living at "that knife’s edge between the next big thing and a truly embarrassing evolutionary dead-end." Greenwood describes futurists as "that peculiar subclass of optimists who believe they can see the day after tomorrow coming." For her mom, that meant having the foresight to develop cutting-edge hardware and software for the video conferencing industry. But it also required an internal clock set firmly to the future, which meant welcoming both the good and the bad. We were constantly wading through early models of doomed technology, and we dressed in, wrote with, and drank out of the detritus of wrecked start-ups. My dad’s favorite polo shirt memorialised a company that had not existed for at least a decade, and for toys we had stress balls and small plastic tops from telecom tradeshows. We had a massive TV-like device mounted with a swiveling webcam before which, at my mother’s behest, I played the clarinet for children gathered in a classroom thousands of miles away. I have not seen one of those in anyone’s living room lately. Sometimes I think I could sell my services to these people with the tagline: ‘I come from the future.’ I don’t have all the hallmarks of a standard techie: my cell phone lives peacefully unconnected to the internet, and I belong to relatively few social networks, but I am from a bubble in time, a place where these things have always existed. I can tell you what users are going to want, because I have seen, over the course of my short life, so many things fail, and so many unlikely things succeed. That said, I would never want to be too far away from those who live and work perpetually in the vanguard, who have chosen that risky, Schrödinger’s Cat-like existence. Even after growing up with my mother and the remains of a hundred half-baked ideas, such people’s willingness to ride the wave, their foolhardiness and their bravery, still provokes awe in me. It’s not a thing I can profess to understand beyond a basic respect for their guts and their kind of crazy hope that the future will be weird. But that’s something I can get behind. Read the entire article at Aeon Magazine.